The Welsh House, Self Catering Holiday Cottage West Wales, Carmarthen | Ty Unnos is Self Catering Holiday Accommodation built between sunset and sunrise. This cottage in a remote corner of Carmarthenshire, looks for all the world like it's fallen out of a fairy tale. All reservations and bookings for Ty Unnos are managed by Under The Thatch. Click below to check availability and pricing. An authentic reconstruction of the legendary house built between sunset and sunrise: the Ty Unnos (One Night House). In Welsh we have a word 'hiraeth', it describes a feeling of belonging to a place, to a person. It's where you are from, it's what you're about. This cottage re-captures childhood memories of a simpler way of life. 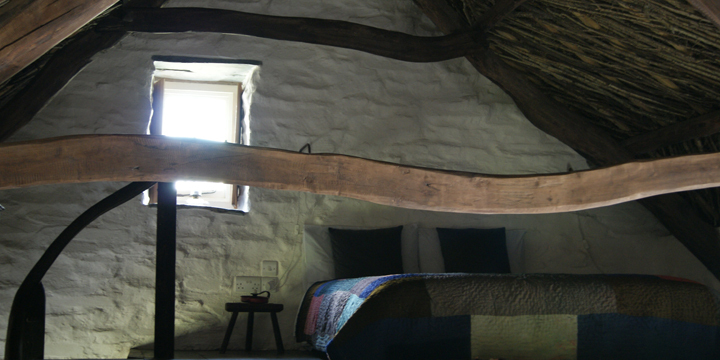 Picture windows offer inspiring views of the rustic Welsh landscape; and it's incredibly peaceful. Inside lime-washed walls and Welsh antique furnishings lend it the air of a retreat, with a refreshing lack of 21st century gadgetry. Ty Unnos presents a purely traditional facade to the outside world, only when you push open the door into the lofty, sunlit living room do you realise that this Welsh cottage is a real step back in time. What’s remarkable about it is that the innovative design remains true to its traditional roots. Its plan is that of a traditional Croglofft - open plan living with sleeping loft. This is a real ‘home-made home’ built in a traditional way using materials readily to hand, stones from the fields, clay from the ground and timber from the woods. Internally the cottage has been furnished with traditional Welsh antiques inspired by Llainfadyn, a slate worker’s cottage from North Wales relocated in St Fagan’s National History Museum. On one side of the large hearth are the table and chairs, on the other is the dining table and elaborate storage cupboard known as a Cwpwrdd deuddarn. Up the steep stairs opposite the hearth is the sleeping loft. 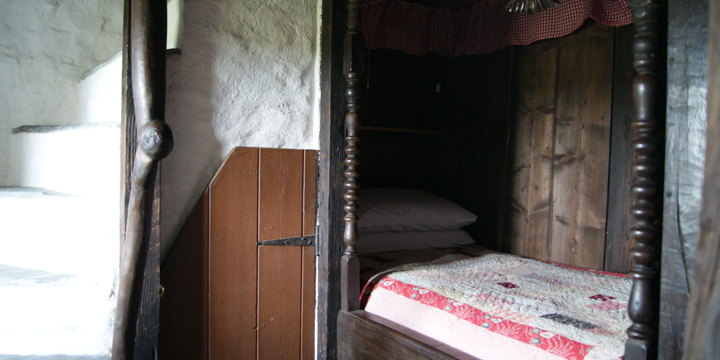 The small alcove on the ground floor under the loft has a traditional single Welsh box bed (you need to be reasonably agile to climb in! ) whilst on the other side there is a small kitchen with basic amenities. Colours are neutral and traditional Welsh antiques add a sense of living history. The only truly modern element is the bathroom! Master double bedroom on open plan mezzanine. Welsh box bed on ground floor (sleeps one adult). Lofty sunlit living room containing an impressive Inglenook fireplace with Welsh country antiques set against the lime-washed walls. Small kitchen beneath mezzanine with basic appliances. Ground floor with semi-sunken bath and modern fittings. Front door opens onto the garden and countryside beyond. Remote rural seclusion in peaceful Carmarthenshire hills of West Wales within easy access of the M4 motorway. The nearest train station is Carmarthen which is a 20 minute drive. Although the cottage is remote it is adjacent to another property but the relationship between them ensures privacy and seclusion. If you want to make a multiple booking sleeping a total of 7 people check availability at Bryn Eglur. The bedroom is up a steep staircase so mind your head. You need to be reasonably agile to climb into the box bed. Features like steps, narrow doorways, restricted headroom might cause access or mobility issues. Ty Unnos has been featured in the following publications and on the following websites.